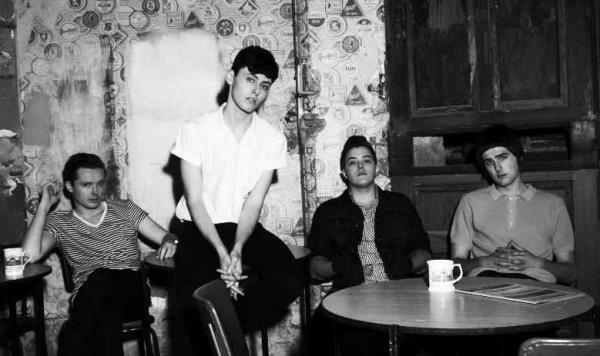 I first met The Heartbreaks in the dark shadows of the Deaf Institutes concert hall, when they were touring with Carl Barât. Matthew was stood behind the bar watching the band ‘Swimming’ do their sound check, and at first I thought he was a student getting ready for his shift on the bar. He told me he was in one of the support bands and then devoured my bag of Minstrels. 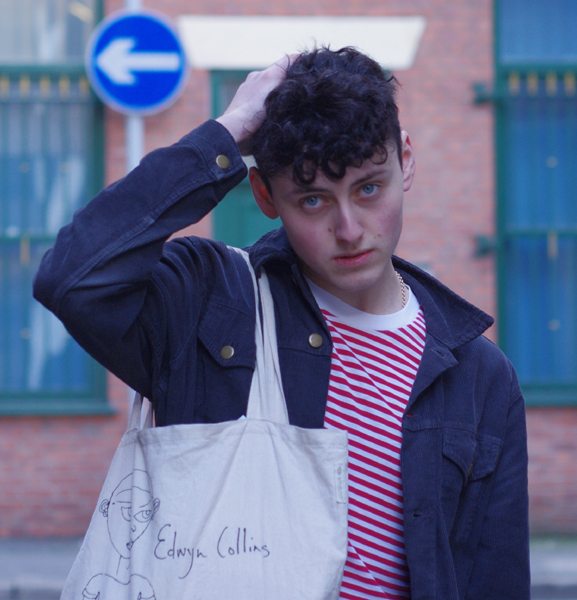 I saw The Heartbreaks perform recently in Salford and in Lancaster, so last week I met Matthew again, at the Earth Café in Manchester where we discussed the band, the Carl Barât tour, the new album and working with Edwyn Collins. You’ve only been together as the Heartbreaks since 2009. Did you know each other before you formed and were any of you in bands together before? Matthew: We did, yeah, Joseph and Ryan and myself have been together in bands before. Ryan, I remember from being very little actually. I remember seeing him on the streets in Morecambe roller-blading. And Joe, Joe and I met at a circus on Ryelands Park in Lancaster when we were eleven. Eventually we left school together and then played under all sorts of various terrible guises while we were growing up. Deaks happened one day out of the blue. He got in touch on My Space and he said, I’m going support you in Lancaster at your show, and I went, ‘Okay, yeah course’ and he came and he had this guitar over his shoulder and he had a leather jacket on and a Madness T-shirt and a Burberry scarf and he was ‘in’ from that moment really. It was only a matter of time before we became The Heartbreaks you know, and that’s when it really felt right. It was sort of like the four of us together and it was perfect. You’ve been quoted as saying “I think forming a band was an excellent way to vent our frustration and anger” What exactly were you frustrated and angry about? Matthew: A lot of it was just general small-town frustrations and part of growing up. But we’re from Morecambe, which isn’t at all a dramatic place and I think the four of us are quite dramatic people individually and even more so collectively, and there’s no place for that at all on the streets of Torrisholme or Halton or Bare and that would make me angry, to the point where all any of us would want to do was be together and play music. I remember when The Heartbreaks first started, we were kind holed up in this old snooker hall off the prom and we rehearsed every day all summer and we didn’t go out. You know, we just rehearsed every day. So it brought us very close together. I think the four of us were isolated from everyone else in Morecambe; there’s no-one on our wavelength at all and it really brought us closer together. So yeah, when I said that I was frustrated, I think we all were, and I think that was one factor that really helped bind us quite tightly. A lot of reviews have compared you to ‘The Smiths’ and I read somewhere that you were a ‘Smiths’ fanatic. Is this true? And has that influenced your music at all? Matthew: Never heard of them, never heard of them (laughs). Yeah, we love The Smiths. I think a lot of the comparisons are to do with the fact that ‘The Smiths’ were making music that was quite natural and organic and intrinsically British at a time when music was very international and synthetic. I can see parallels between the music that is around now and the music that they were making and so I can see if that. I think obviously being based in Manchester has a lot to do with the comparisons and I genuinely think if we were from New York, people would say we were like Blondie or if we were from Glasgow, people would say we were like Orange Juice, I really do think that. The Smiths we’re huge, huge fans of them and I think they’re one of my favourite bands just now. What music has influenced the band? Matthew: Our influences are interesting because they’re really quite disparate and I think that’s because were not from Manchester where there is this huge lineage of bands that can influence young outfits like ours, you know, and Morecambe didn’t have that. We didn’t have an Oasis to aspire to, you know, we had no one and so we would listen to Motown and Northern Soul and ‘60s girl bands. Bruce Springsteen we like. I think those feelings, again, and frustration that we share in our music. The Jesus and Mary Chain, The Buzzcocks, Blondie, The Pretenders, The Ramones, Orange Juice, The Kinks they’re all influences. Going on to your recent tour, supporting the ex-Libertine Carl Barât, what was touring like for you? Matthew: Hungry! We had no money at all. Before that tour, I spent all my money on a guitar and I had to eat just pasta and mayonnaise for three months; it was all I ate. At this point, we were all very skint and all the food that we ate for a month was stolen food from service stations and when Carl would go on stage, we’d eat his rider. And so I lived off a diet of stolen food, which is no way to live really. No wonder you nicked all my Minstrels! Matthew: Definitely. Now you understand, it was the first square meal I’d had in weeks! It makes hungrier, you know... great music is not made on a full stomach. You need to be hungry. You need to want it, you need to go through that I think; it’s important. Bands freak me out when they appear out of nowhere. You need to go up and down the motorways of Britain a few times in the back of van and not eaten. You need to... You need to do that. It’s your apprenticeship. You have to. Ryan: It was great getting away for a bit, not going to bed and having beer for breakfast. Carl Barât had various family members in his band (Ollie B and Edie his girlfriend) didn’t that feel strange? Matthew: It was nice. The Carl tour was lovely, because we really got on with everybody. We really got on. The nicest bit was the big crew and everyone, it was lovely. I can’t speak highly enough of everybody involved on that tour. It was wonderful and it was great to go on tour with the band. You get tired because obviously you’re playing every night, by the end of the tour you feel great. And watching Carl as well, seeing him and his band get better every night was really exciting. I watched him every single night and I didn’t get bored. I watched every sound check and I didn’t get bored once. Matthew: Highlight of my career... I really loved the moment when the first records arrived at me house. The first vinyl and the big box when it arrived at my house in Rusholme. I had the lads all round and we opened it up, and we held the vinyl. We designed it ourselves, you know, we recorded it ourselves and put all our own money in, and that was really rewarding, something to show your dad, to prove we weren’t just in Manchester dicking around. You’ve been famously been ‘Publicly Barred’ (as quoted in The Sun) from Peter Hook’s nightclub FAC251. How do you feel about that? Matthew: Peter emailed me. Well he emailed ‘The Heartbreaks’ but it was to me and it was intercepted by management and it got passed on to The Sun newspaper and etc. etc. It was something that I didn’t like to happen, I’d rather it was kept to ourselves because he had the dignity and the decency to email a reply to it, and I really respected that. And so I have emailed him back at present on My Space, but I don’t know if he’s opened it. So there’s nothing I’d like to say at the moment, until he’s read it. You already have an arsenal of songs under your belt. When can we expect an album? Matthew: Soon... God. We can’t hang around forever. Me and Joe were talking about it yesterday and he said something really lovely about the album being a ‘snapshot of where we are at the moment’, I really like that, and I don’t want to hang around too long, because the songs we have now are wonderful and I want to get them just recorded and out, and so it’s kind of done. I don’t want to hang around playing ‘Liar, My Dear’ forever. We’re working with Edwyn Collins at the moment at his studio and he’s fantastic. We’re all huge fans of his work he’s a great producer and his engineer is fantastic. And so we’re looking for June, and if not June, it’ll be September. The last 18 months have been truly memorable for you. You’ve claimed the MEN title best band to break into 2009, supported ‘The View’ and ‘Carl Barât’ on tour what do you have planned for 2011? Matthew: We’ll do our own tour and play with Carl at the 100 Club. And yeah, release the album. We’re doing our first European tour early in the year, I think. I’d really like to go to Japan. Obviously we’ve been on a few magazine covers, and it’d be good to be ‘big in Japan’. I’d quite like that. So you’re doing a new single. What’s the title? Matthew: Well it’s all up in the air at the moment. We’ve recorded a few potential singles. Would you ever consider performing at one of the UK festivals? Matthew: I don’t really like festivals. I don’t think it’s any way to see music. I think it’s borne out of that kind of iPod Shuffle culture where you like one song of every artist. It’s not for me really, but if anyone wants me to play them, I’ll certainly go and play them. It might be a laaaugh. Matthew: I’d love to go to Glastonbury, yes. No, no, I would like to play there and things like that really. Me and Joe went to Leeds festival in the summer, I didn’t really like it I wasn’t bothered by it, I saw the Libertines though, and The Cribs. What was the reason for your recent trip to Milan? Matthew: That was.. the singer Bono from a little band called U2, he started a label with with his lovely wife Ali Hewson and it’s all kind of ethically made in Africa and all of that jazz. And yeah the guys went along and played at the launch for Milan Fashion Week, but we didn’t really see a lot of Milan. It was kind of airport, car, hotel, car again, hotel, car, airport. But we met Ali and she’s really lovely and, yeah, it was our first gig away as well and we were all thrilled. Matthew: No, Bono wasn’t there. He was meant to come and then someone injured themselves in, I think, a Spiderman musical in New York, which was a great shame. Yeah, it was a shame. You have been in London recording with Edwyn Collins (from the Scottish post-punk band Orange Juice), can you tell us more? Matthew: Yeah, he’s got a fantastic studio and he did an TV show as well and in the late ‘90s about his recording studio with his engineer; it’s really funny. I would recommend you to try and find it if you can. Yeah we were down there and it feels really right working with him and his engineer, he was just fantastic. They both understand what we want and what we want to do with the record. So I have high hopes, yeah. ... And he has a fantastic guitar collection, an absolutely fantastic guitar collection. How many guitars have he got? Matthew: Hundreds, too many. I asked him if we had enough the other day and he doesn’t think so. He has a lot of guitars, beautiful, beautiful guitars. Matthew: Yeah, I played on one from the ‘Rip it Up’ video as well, I enjoyed that. There has been a lot of ‘Media Hype’ about the band recently, your friends and families in Morecambe must be proud. How has your fame affected them? Matthew: It’s good because it acts as evidence that we’re actually doing something, because I think for a long time they didn’t believe us, that we were working or anything. I think they thought we were in Manchester messing around or something. So it’s good in that sense; my grandma keeps a scrapbook. The Morecambe Visitor is a very nice paper to us and they’re always saying very nice things and... Yeah, well Ryan’s always lived in Morecambe, he didn’t move to Manchester when we did, so he’s kind of a local celebrity in Morecambe. I think he’s almost at the level where he could open sports halls and gyms and things, like he’s nearly at that level, swimming baths and all that, yeah, he’ll be launching boats in Morecambe Bay with a bottle of Champagne, to be honest with you. That’ll be him. (laughs). Was it always your big dream of being a front man or did it just happen? Matthew: Nobody’s ever asked me that. I guess it just happened. I always knew I’d do something different. I just had a feeling, forever. I started playing guitar when I was young, and I soon as I learnt three cords all I wanted to do was play. Joseph writes the songs, and when we met it just felt really right and it just feels really right to sing Joe’s songs, and he’s a fantastic writer, so it doesn’t feel like I’m singing somebody else’s songs. You know it feels right. It feels like I should be singing those songs. I don’t know what it is, It’s hard to explain. I think it’s probably because we’re very close and we’ve grown up together and been through the same things. I’d rather be a front-man than a singer. Joseph, as the main songwriter, do you base the lyrics on things that have happened to you in your life or to the lives of the other band members? Absolutely. I couldn't imagine writing a song about something that I wasn't in some way personally or emotionally attached to, and that is the main connection between all the lyrics in our songs, the fact that they were written as a form of expression, expressing things that were playing on my mind. I guess I could be seen as quite set in my ways just writing in this formula but I find it rather therapeutic and it's the only way I know. I believe that songs should be written because they had to be. The day I start writing songs for the sake of it I'll probably stop and get in to badminton or something. Joseph, you put all your heart and soul into your performances, I’d like to know which drummer most influences you? Richard "Pistol" Allen, Clem Burke, Reni. They all had heart and they all had soul, I'm not in to drum machines, they don't have a heart or a soul and I'm not in to drum solos or that kind of thing. There's no need. The drummers I've mentioned there all had their own distinct style but their style never overpowered the songs in which they played. Melody is everything and the drums should support it, to do so whilst still leaving your own impression on a song is what makes a great drummer in my opinion... I'm sure many heavy metal fans would strongly disagree with me, but I don't care because my hair is nice and clean and theirs is not. Deaks, You are very animated on stage, are you influenced by any particular guitarist that has gone before you? In terms of playing I could pick three or four in particular (Rourke, Simonon, Pattinson) but with regards to movements it’s more of a reaction to the stereotype of the boring bassist, stood in the corner, plodding away. Ryan, What guitar do you play and if money was no object what guitar or who’s guitar would you buy? I play a Rickenbacker 330, and it’s black, although at the moment its snapped in half. Edwyn Collins has got a Rickenbacker that lights up, so I’d buy any guitar that lights up. I feel good about that, yeah. Yeah, I feel good. ‘Steve Lamacq’, you can’t argue with Steve Lamacq can you? And yeah, singing is a work in progress for me. I think I will get better. I’m not as good as I want to be yet, I’m still practising and so it’s encouraging to hear that. Yeah, it’s a work in progress. Every one has a song that defines some point in their lives, what’s yours? Matthew: It’s really odd, but I don’t really have that at all. when the Strokes came out and all that we were twelve, you know and it didn’t quite hit Morecambe, the Indie explosion you know, so we were quite isolated from it. When we were about eighteen we were still listening to The Kinks and the Small Faces and The Jam and stuff, we didn’t get involved in the whole big Indie boom. Then when the Arctic Monkeys came out it wasn’t ‘my’ band either, The Libertines I really loved, but mainly because they wore hunting jackets like The Kinks. So I never really had a band that I could count as ‘my band. And so, really my band, is ‘The Heartbreaks’. So when I think of points in my life I think of Heartbreaks songs and what we were doing around those moments, you know, and like Joe said about the album, it feels like a snapshot of where we are ourselves. ‘Liar, My Dear’, because I remember Joe playing that song to me. It was just me and him there and it was in his basement and I thought it was probably either the worst song I’ve ever heard in my life or the best. And when it came out I felt like we were doing something you know, and I felt really happy about that. So yeah, I think ‘Liar, My Dear’ is my defining song and yeah I love singing it. Joseph: That's one of the many beauties of pop music. A single song can take you back to a certain moment in your life. For example when I was sixteen I used to bounce down Morecambe promenade on my way to work as a bingo caller with a woman's feather cut, in a sky blue Harrington jacket and adidas sambas with my headphones on listening to ‘Life Will Be The Death of Me’ by the highly unfashionable Ordinary Boys. So there you go... Looking back it's a pretty rubbish song and I had pretty rubbish hair. Deaks: ‘Seasick, yet still Docked’ by the fairly unknown folk singer Morrissey always takes me back to the period immediately before joining the band. Sleeping on floors without a penny in my pocket, but even worse, without much hope at all. It just came along at just the right time. Ryan: Defining song... Knas. I watched Laidback Luke play it. Yeah the house tune, it was at Sankeys on 27.12.10 it was just a great moment really. Loads of us sharing the moment. The closest I can get to Ibiza. Tell me a unique fact about yourself? Matthew: A unique fact about myself? I say, I could tell you one about each of them. I’ll start with Joe, Joe’s got the best unique fact. Joe was filmed in the pilot episode of CBBC when he was a kid, to be introduced on Ghost Hunter, and he was the ghost in Ghost Hunter, but he burnt the set down and he got thrown off. He literally burnt it down? I don’t know. There’s a pilot I’ve seen it, it exists... of Joe being the Victorian shoe shine boy in Ghost Hunter. Is it on You Tube? No, it’s not.. We’re the only people that’s got it. Yeah, so he got thrown off that. ...I watched Edwin Van Der Sar, the Manchester United goalkeeper, eat strawberry ice cream when I was an ice cream man, and he gave me a tip of £1 for my work, which is quite a big tip to get. £1 is quite good when the ice cream is about £1.40; it’s quite a lot. So yeah. Joseph: I also burnt down the set of Grange Hill... Should you choose not to believe the stories of me burning down the sets of various late 90's CBBC dramas, I am also the second cousin of Polish goalkeeper Jerzy Dudek. He's a smashing lad. Ryan: Unique thing about me... I am a direct descendant of William Wallace. Where does the band get their look from? Matthew: Well, I don’t know really. It wasn’t really thought out or anything. It’s not a conscious thing. We’re all different people fashion wise as well, you know. People who we like and various things from Stuart Sutcliffe to football casuals to mods and the rockers and you know, culture in general. I suppose, a little bit of everything. Yeah, it’s not thought out at all; it’s just happened really. Matthew: Any last words? You need something quite good for a last words don’t you?